Super Bowl Sunday and Pliny release weekend made this place empty early in the day. Sampled a few and got a crowler to go.Went for their highest rated beers, and was underwhelmed. I had just come out of RR, so perhaps my palate was skewed. Still found them rather pedestrian. Open and inviting, kind of industrial feel. No guest taps, Flight options were for the whole lineup, else just 10 oz pours available. 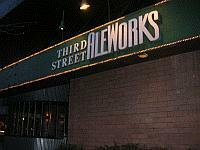 A decent spot to come and imbibe in craft beers, but Third Street Aleworks pales (no pun intended!) in comparison to their neighboring microbrewery, the famed Russian River Brewery. That said, the food was good, but standard pub fare, and the beers I tried on their flight menu were of mixed quality. Most of them were of a respectable grade, but few of them stood out. If Russian River is too packed to enter due to a big event, let Third Street pick you up on the overflow, but don't there expecting to drink anything that equivocates Pliny. One of the larger micro-brew houses in Sonoma county, CA. But not even in the running for tasty beers or tasty food. The pub is always busy. The vibe is young and northern California cool. It's a hang-out in Downtown Santa Rosa. Popular. But the beers (I've tasted 10) are all underwhelming. Funny story: I'm sampling the menu with the 2.5 ounce shots. I'm with my beer super-snob friend who is from Birmingham England. Neither he nor I are really relishing the various beers. As a certified wino I know that some of the tastiest red wines are blends. So to the horror of the wait staff I take the 10 samples and pour them all together into a 22 ounce glass. It tasted extremely delicious. Heresy? Sure. Would I do it again? You betch'a! Google reviews held this place much higher than on here, but I wasn't terribly disappointed. Good vibe with 90's alt rock, so you can't go wrong with that. The server was friendly and attentive, so no fault there. Their house beers were ok at best (we tried 4 between the 3 of us) and food was standard pub fare. Not mind blowing, but a decent alternative if you don't want to die of old age in the Russian River line. Great service and beers. Knowledgeable and friendly bar tenders. Cool vibe/music. Very typical brewhouse kind of setup. It's a good place to watch a game while you get dinner and some beers. The food and beers are both decent in quality, I've never had issues. Service is fairly average, no bad experiences and nothing that really stands out. The beer selection is pretty good, lots of different styles. Went late on a week night and it was still buzzing. Very friendly staff and tasty food. The sampler is the way to go. The night I was there it included 10 drafts and 2 cask ales. Beer isn't as good as their neighbors (Russian River) but still enjoyable. Decent, but not exceptional beer. Food is fine at best, service is constantly inconsistent. Go to one of the many other breweries or tap rooms in town instead.